One of the Lower Mainland’s five border crossings between Canada and the United States is getting a big upgrade to help speed up traffic flows. Construction is now underway at Highway 13’s Aldergrove-Lynden border crossings, which entails widening a section of the highway from two lanes to five lanes, including new southbound Nexus and commercial vehicle lanes and a northbound truck climbing lane. 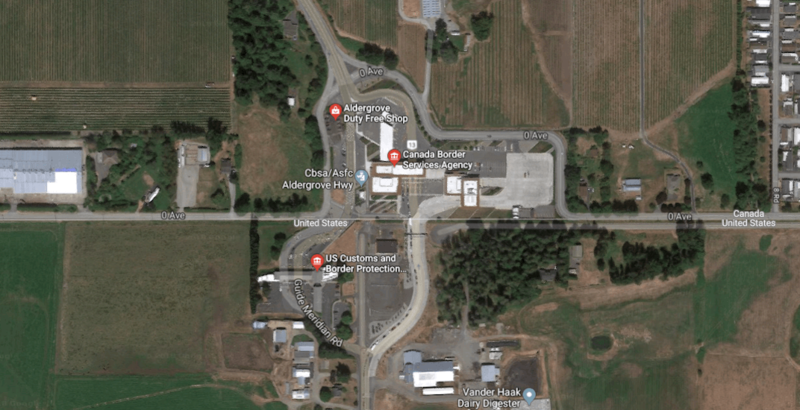 There will also be a new east-west connection and signal at 3B Avenue, a safety improvement at the intersection of Highway 13 and 8th Avenue, and pedestrian and cycling facilities at 0 Avenue. “Highway 13 supports a growing community and a busy border crossing where people are often stuck in a traffic jam. We’re building more capacity to keep people and commercial traffic flowing without such long delays,” said Claire Trevena, BC Minister of Transportation and Infrastructure, in a statement. The $15.4-million project will be completed in fall 2019, and it is expected traffic delays related to construction will be minimal. Other border crossings in the region are located on Highway 99 (Blaine – Peace Arch), Highway 15 (Blaine – Pacific Highway), and Highway 11 (Sumas). A fifth crossing provides access to Washington State’s Point Roberts peninsula.